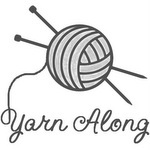 Yarn along – Week 41 – Can knitting be an obsession? Yes, of course, I enjoy travelling in my free time. I wouldn’t have this blog if I wouldn’t. If I’m not travelling I do numerous things. But I think I might be addicted to knitting. When I went to Vienna on the weekend, I packed my yarn and needles to have something to do on the flight. 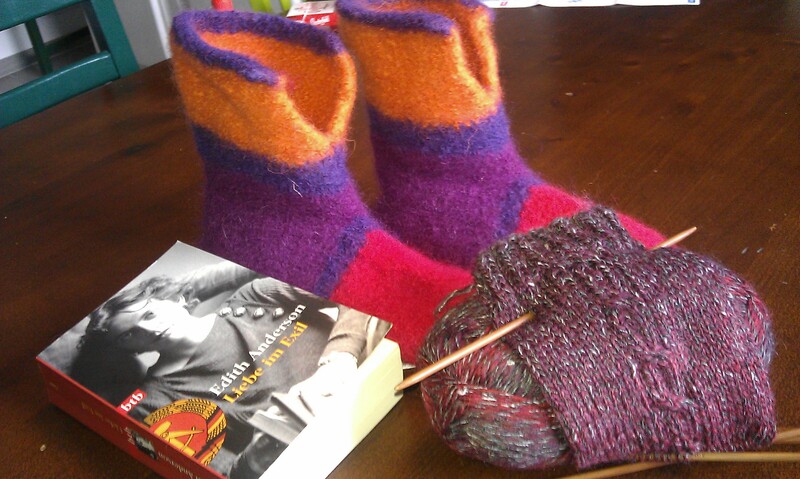 And when we went to London last fall, I took my big needles with me too for doing knit-felted slippers. Both times I even had to open my hand luggage because I was carrying needles and they were a bit confused on what they saw on their screen when monitoring my luggage. Even when I went to the Netherlands on my bike tour I took some needles and some yarn to keep me occupied during the train travel. I sat in the train with luggage and bike and was knitting. Knitting is meditation. It is keep hands and mind occupied. It is really producing something. And I even sell some of my stuff at Dawanda. Today I’m again joining Ginny’s Yarn along. This week I started with another pair of knee high socks which get a braided pattern on the sides, worked a bit more on Michael’s sweater vest, finished another pair of knit-felted ankle high slippers and started reading “Love in Exile. An Amercian Writer’s Memoir of Life in Divided Berlin”. If you want to know how to do the slippers you’ll find a tutorial as a guest post at Marigold’s Loft and there is even a give away! And please don’t forget to check out her guest post here at my blog too! This entry was posted in Knitting & Crocheting and tagged Knitting, Slippers, Socks, Yarn Along by kathatravelling. Bookmark the permalink. Los patrones para las frutas y el cacahuate están, en su mayoría en Ralverly. Your projects are lovely! I’ve never taken my knitting on a flight though, I was always afraid they’d take it away from me. The book you’re reading sounds interesting, by the way, I think I’ll check it out. Thanks a lot! I think, as long as you use wooden needles they really can’t object (even though with the 8mm wooden ones which are actually quite pointy you could impale someone if you really tried, yet a pen would do for that too). But even with metal ones. What should they say? Needles for knitting are not on the “don’t bring along” list for flights. Yeah, another one! There should be more of us. I get usually stared at knitting at airports but on the other hand, I mostly end up in funny conversations with people, old ladies most of the time but on sunday I actually had to explain what I was doing to a Dutch guy who was wondering why I knit and after every round make weird notes on a piece of paper (to remind me what I did when, as I need to repeat it exactly the same on the other sock…). beautiful projects……and yes you can definitely call knitting an obsession!! I have it as well! !